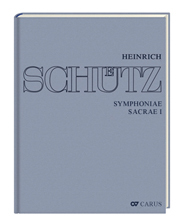 Heinrich Schütz spent his whole life searching for that which is new in music. The Symphoniae Sacrae I, which were presented in 1629, also testify to this. Schütz composed them as a result of the impressions made upon him by his second journey to Venice. In addition to the numerous Italian stylistic traits which can be traced back to Monteverdi, the 20 concertos – all in Latin – particularly impress with their great variety of timbres: solo pieces, duets and trios for all voice type are combined with diverse string and wind instruments and are governed by the emotional and expressive world of the text. 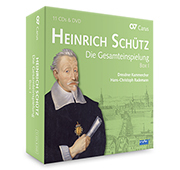 The recording impressively continues the award-winning Schütz complete recording with the Dresdner Kammerchor conducted by Hans-Christoph Rademann with the customary top-quality soloists such as Dorothee Mields, Felix Schwandtke and others. Solisten, der Dresdner Kammerchor und die Instrumentalisten bieten erstklassige Interpretationen. There is not a weak link in the chain. 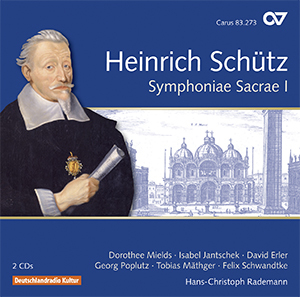 ... Rademanns series is establishing itself as the definitive Schütz-Werke on records. The singing here is polished and spirited, and the playing is sometimes more robust and forceful, especially by the dulicians and trombones. They [the singers] maintain a consistent clarity and discretion in bringing out the words but by no means neglect emotion. 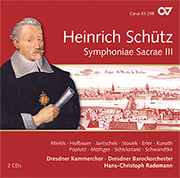 Dieser ... Beitrag auf dem Weg zu einer vollständigen Aufnahme sämtlicher Werke von Heinrich Schütz ist Hans Christoph Rademann und seinem bewährten Musikantenteam besonders eindrucksvoll gelungen.